MEDFORD/SOMERVILLE, Mass. 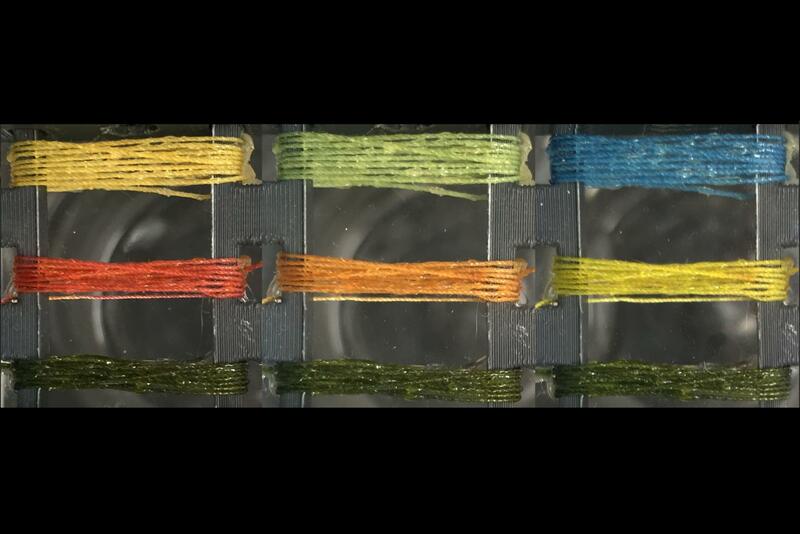 (April 4, 2019) — Tufts University engineers have developed a novel fabrication method to create dyed threads that change color when they detect a variety of gases. The researchers demonstrated that the threads can be read visually, or even more precisely by use of a smartphone camera, to detect changes of color due to analytes as low as 50 parts per million. Woven into clothing, smart, gas-detecting threads could provide a reusable, washable, and affordable safety asset in medical, workplace, military and rescue environments, they say. The study, published today in the journal Scientific Reports, describes the fabrication method and its ability to extend to a wide range of dyes and detection of complex gas mixtures. The study used a manganese-based dye, MnTPP, methyl red, and bromothymol blue to prove the concept. MnTPP and bromothymol blue can detect ammonia while methyl red can detect hydrogen chloride – gases commonly released from cleaning supplies, fertilizer and chemical and materials production. A three-step process “traps” the dye in the thread. The thread is first dipped in the dye, then treated with acetic acid, which makes the surface coarser and swells the fiber, possibly allowing more binding interactions between the dye and tread. Finally, the thread is treated with polydimethylsiloxane (PDMS), which creates a flexible, physical seal around the thread and dye, which also repels water and prevents dye from leaching during washing. Importantly, the PDMS is also gas permeable, allowing the analytes to reach the optical dyes. Tufts University, located on campuses in Boston, Medford/Somerville and Grafton, Massachusetts, and in Talloires, France, is recognized among the premier research universities in the United States. Tufts enjoys a global reputation for academic excellence and for the preparation of students as leaders in a wide range of professions. A growing number of innovative teaching and research initiatives span all Tufts campuses, and collaboration among the faculty and students in the undergraduate, graduate and professional programs across the university’s schools is widely encouraged.